but so do many United States coins! 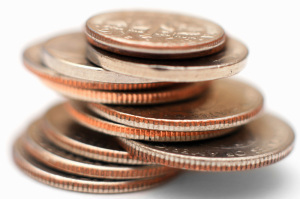 Quarters and dimes have a “reeded” edge, while nickels and cents have a “plain” edge. Reeded or ridged edges have been in use for a few centuries, and for many years were applied only to gold and silver coins – to discourage the filing or clipping of precious metal from the edges of coins. Edge shaving was a commonplace occurrence on plain-edged gold and silver coins during the 17th and 18th centuries, as unscrupulous individuals figured the next person to possess a coin would simply never notice it was slightly smaller and slightly lighter! Edge shaving on reeded coins was easily detected. To learn more about “The Language of Coins” click the image above. Reeding came into widespread use with the introduction of the collar die in semi- and fully-automatic coin presses during the late 1700s and 1800s. Encircling each coin blank as it came into the press, the collar die could bear an inscription or a design such as reeding. As the obverse and reverse dies came together with great force against a gold or silver coin blank in the press, metal from the coin blank would flow “outward” into the grooves of the reeded collar die. Though not the original purpose, reeding also made counterfeiting of coins much more difficult – requiring the skillful application of a third “vertical” design to a phony coin in addition to the obverse and reverse motifs (with that kind of talent, a counterfeiter could easily find lucrative legitimate work as a medalist or minter). Yet another advantage to reeded edges is that they give coins a more “finished” appearance and usually embellish the overall design and artistry of a coin. These benefits of counterfeiting deterrence and design enhancement have been enough to promote widespread use of reeded edges on coins made of base metals as well as those struck in precious metals like silver and gold. One other unintended advantage of reeded-edge coins was discovered during the Great Depression, when unemployed men would pitch pennies, nickels, dimes, quarters or even half dollars on the sidewalk to win a few coins or to relieve idle boredom. With the object being to land your coin closest to the building, some frequent participants found they could better grip and control the toss of reeded-edge coins! So they favored dime or quarter competitions featuring reeded-edge coins over penny or nickel tosses involving plain-edge coins. This aspect was of course never considered when reeding decisions were made at the U.S. Mint! Reeded edges first appeared on U.S. coinage in the 1790s on half dimes, dimes and quarters struck in at least 89% silver, and on $2.50 gold quarter eagles, $5 gold half eagles and $10 gold eagles minted in at least 89% gold. The intention during those early years of the U.S. Mint was to thwart edge clipping or filing of precious metals from coins. That intention, along with design enhancement and counterfeiting deterrence, continues today with reeded edges found on silver and gold U.S. commemorative coins as well as silver and gold American Eagles. For design and counterfeiting considerations, reeded edges are also found on copper-nickel clad dimes, quarters and halves. Serving a similar purpose to reeding, edge inscriptions are seen on the oldest U.S. half dollars and dollar coins struck in at least 89% fine silver. 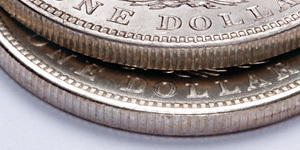 The edge on early 50¢ coins reads fifty cents or half a dollar, while the edge of early silver dollars is inscribed hundred cents one dollar or unit. Edge inscriptions including mottoes, dates of issue and mint marks are found on currently-issued Presidential and Native American dollars. Wide edge reeding on a small percentage of 1921 Morgan dollars features 157 reeds along the edge instead of the usual 189 reeds. Experienced coin collectors always have an eye out for varieties of special interest, and there are even popular varieties in reeded edging. Our Buyer’s Choice in Littleton’s Spring 2014 Showcase offered the 1921 Morgan silver dollar with sought-after Wide Edge Reeding. This seldom-seen Morgan dollar variety features 157 reeds along the edge instead of the normal 189. So reeded edging has attained importance and prominence in the coin collecting hobby! 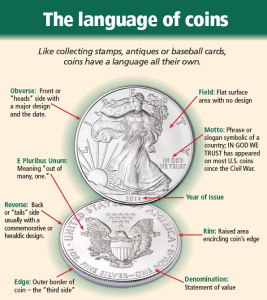 To learn more about the language of coins and terms like “reeded edges,” visit Littleton’s Learn Center.